The audio of Vivek-Sonia Aggarwal starrer Palakkad Madhavan was launched at Sathyam Cinemas. Anirudh and Siva Karthikeyan are the chief guest of this audio launch event. 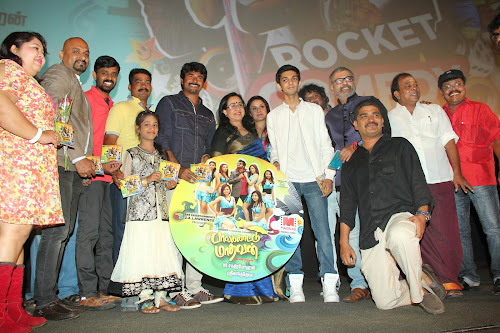 During the audio launch of a movie, Sivakarthikeyan expressed his wish to share screen space with Vivek. He told that Vivek is one of the actor whom he admires a lot, and he will be happy if God gives him a chance to act with him. Also the 'Maan Karate' actor revealed that he copied Vivek's comedy dialogue from Kushi. Vivek says "Adiyae Rathi akadi kothiri" when giving farewell in the college which Siva Karthikeyan repeats it in Maan Karate. Directors might have heard Sivakarthikeyan’s wish to act alongside Vivek, and everybody hope that someday, this dream combo will grace the big screen in spanking passion. ‘Palakkad Madhavan’ is expected to be a high voltage comedy entertainer. Sonia Aggarwal, who is trying hard in her second innings in cinema pairs with Vivek for Palakkad Madhavan. Yesteryear Malayalam actress Sheela is doing pivotal role, and the supporting star cast includes, Mottai Rajendran,Manobala and Imman Annachi. 'Palakkad Madhavan' is directed by Chandra Mohan of 'Soundarya' fame and music is by Srikanth Deva. The makers of Soundarya, Kuruvanna Basheer on behalf of ABC Dreams Entertainers will be producing this film as well.